One of this year’s most highly anticipated movies is Ready Player One, the latest from Steven Spielberg. It’s the big screen adaptation of Ernest Cline’s beloved novel. There’s as much riding on this film due to its fan base as there is with a new Star Wars or Marvel movie. In Columbus, Ohio in 2045, reality is a real bummer. The need to escape to a different world is paramount for so many people. The OASIS is a virtual reality world that provides an escape for people to get away from their desolate home life. Their homes are tiny trailers and vans stacked on top of each other, aka “The Stacks”. Wade Watts (Sheridan) puts on his visor to morph into his avatar Parzival to carry out the majority of his day in the OASIS. As he says, you can be anyone you want to be and do whatever you want inside the OASIS. There are people he meets inside like Art3mis (Cooke) and Aech (Waithe) who are his best friends, yet he has never met them back in the real world. The man behind the OASIS is James Halliday (Rylance) whose recent death has the world in mourning. His final proclamation to his fans is the announcement of a new game. Buried deep within the Oasis are three keys all with clues leading to the golden Easter egg. Whoever finds the egg becomes the grand prize winner and inherits his stock and fortune from the Oasis. It’s no easy feat, even for those staunch Halliday and Oasis aficionados. Five years pass by and no one has found the first key. Parzival uses everything he knows about ‘80s pop culture and the life of James Halliday and finds that copper key. His name appears on the leader board catapulting him to celebrity status. He’s not the only one desperate to get his hands on the Easter egg. Ben Mendelsohn stars as the token villain, Nolan Sorrento. He’s the head of an evil corporation named IOI (Innovative Online Industries). He sets out and orders his minions i-R0k (Miller) and F’Nale (John-Kamen) to kill Parzival whether it’s in OASIS or in the real world. Director Steven Spielberg has made a love letter to his fans with this film. Watching it feels like he made it for me and the legions of other movie and video game geeks out there. It’s stacked to the brim with pop culture references from all things Steven Spielberg, Stephen King, Atari, and other video games and songs that made up the 1980s. Try not to tap you toe along with its dance club-filled soundtrack. 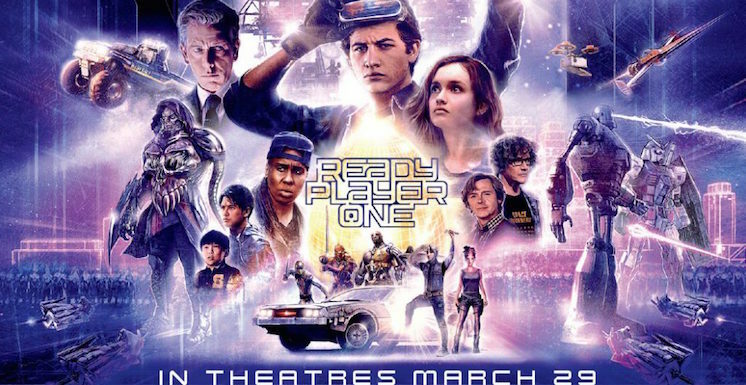 Author Ernest Cline was inspired by Spielberg’s work, so it feels appropriate that only he could bring the book to life. Along for the ride is Spielberg’s go-to cinematographer, Janusz Kaminski. Together they get the ball rolling with the opening race sequence. It encapsulates the exciting thrill ride that is the rest of the movie. It becomes a race for the audience to spot all the references thrown out in this one scene, including: the ’66 Batmobile, the Back to the Future DeLorean, and King Kong, just to name a few. More importantly, this scene also showcases the stunning technical work at hand with how it all comes together. The film mixes live action, motion capture, and other CG tricks as it goes between real life in the Stacks versus what happens in the OASIS. They shot it using 35mm film giving it that grainy VHS quality as a nod to the times. This choice provides a greater contrast to the OASIS sequences. It’s a visually stunning feat with seamless transitions. This shouldn’t quite come as a surprise as this is what we love about Spielberg. He knows how to make any movie artistically sharp when you think back to how he created the shark in Jaws or how he revealed the dinosaurs in Jurassic Park. It would be a shame not to recognize the special effects work come award season. The look of the film is obviously complex to pull off, yet the story is quite simple and effective. Part of it is the underdog David and Goliath story with Wade/Parzival going up against Sorrento. It’s all set to a very Willy Wonka and the Chocolate Factory model hence the use of “Pure Imagination” in the film’s trailer. Wade/Parzival is the Charlie Bucket looking to inherit Halliday’s chocolate factory, the OASIS. Spielberg reminds us that this is more than just a silly video game movie. There are shots along the way where the humans are in battle and we see them interacting by themselves with their visors and gloves on. It’s that growing trend we’re facing with everyone buried in their phones without having a personal interaction with the person next to them. The character of Wade/Parzival asks the viewer to find their purpose in life, like he has, so there isn’t always this instant urge to run off to a different reality as found in video games, movies, or television. It’s a bit ironic coming from a movie where it idolizes the 1980s pop culture scene. It may be my adoration for all things Spielberg, but I found Ready Player One extremely accessible for non-gamers out there like myself. When reading the book, it’s saturated in video game language where the movie feels open to a larger audience. Staunch lovers of the book will notice substantial differences, but it’s worth keeping in mind that getting the rights to showcase certain references became an issue with bringing the movie to life. Author Ernest Cline co-wrote the screenplay with Zak Penn, so I trust his stamp of approval over the film. Spielberg has created another crowning achievement that’s more than a nostalgic trip for those who grew up in the 1980s watching his movies. I would hope that the younger generation dazzles in the eye-popping storytelling much like I did when I saw Spielberg’s early films as a kid. On a deeper level, I hope they take note of the diversity factor at hand when Wade and his High Five gang come together for the first time as humans as opposed to avatars. They’re bound by a common goal regardless of age, gender, or ethnicity. Maybe, just maybe, they’ll put their phones down long enough to talk about it in actual reality instead of the virtual reality of Snap Chat-ing about it. Is It Worth Your Trip to the Movies? It’s the vintage Spielberg we all know and love.